The Aztecs won 10 out of their last 13 games including a six-game win streak and going 7-0 at home during that stretch. The team improved its record to 26-12 and 12-9 in conference play. The Aztecs had previously dropped four of six the week before. Freshman JJ Rollon won the ACCAC Division I player of the week for the week of March 25-31, hitting a .476 at the plate. The Aztecs traveled to Scottsdale to take on the Artichokes, spliting a doubleheader with them. The Aztecs pulled off the comeback from 1-0 in the third inning when starting pitcher Austin Bryan gave up a solo shot. Bryan shrugged it off as he pitched a complete game, racking up 12 strikeouts and improving to 7-1 on the year. Pima loaded the bases in the fifth inning before Angel Ochoa hit into a fielder’s choice that scored Rollon, tieing up the game at 1. Phillip Sikies followed that up with a go ahead, taking the 2-1 lead. Pima dropped the second game in a heartbreaker. The team fell behind 3-0 early in the third inning before taking a 4-3 lead in the fifth. In the seventh, Rollon hit an RBI single to add to the lead making it 5-3. Scottsdale would get that run back in the bottom of the inning, bringing them within one run to 5-4. The Artichokes would go how to score 2 runs in the bottom of the ninth inning and win on a error. Sikies took his first loss of the year, giving up 2 runs, 1 unearned, in the ninth. Pima swept Langley Blaze Prep in a double-header at home on March 28. The Aztecs beat the Blaze in Game 1 in a 14-4 run rule romping. It was a close game with the Aztecs taking a 4-1 lead into the bottom of the fourth before Pima exploded for a 10 run inning, ending the game the next inning 14-4. Pima jumped ahead early and never looked back as Karl Koerper went on to hit a game-ending walk off homer run-to-run rule the Blaze. Emilio Lovato picked up his second win in a complete game, giving up 4 unearned runs and bringing his record to 2-0 on the season. Pima traveled to Glendale to play a doubleheader against the Gauchos. In Game 1, sophomore Adam Moraga picked up his fifth win of the year. Moraga pitched a gem, tossing a one-hit shutout in an 8-0 victory over the Gauchos. Pima jumped out early, scoring 3 runs in the first innings as Sikies, Rafael Padilla and Enrique Porchas all drove in runs. The Aztecs tacked on three more in the fourth as Fabian Ferreira, Cole Cummings and again Padilla all drove in a run making it 6-0. 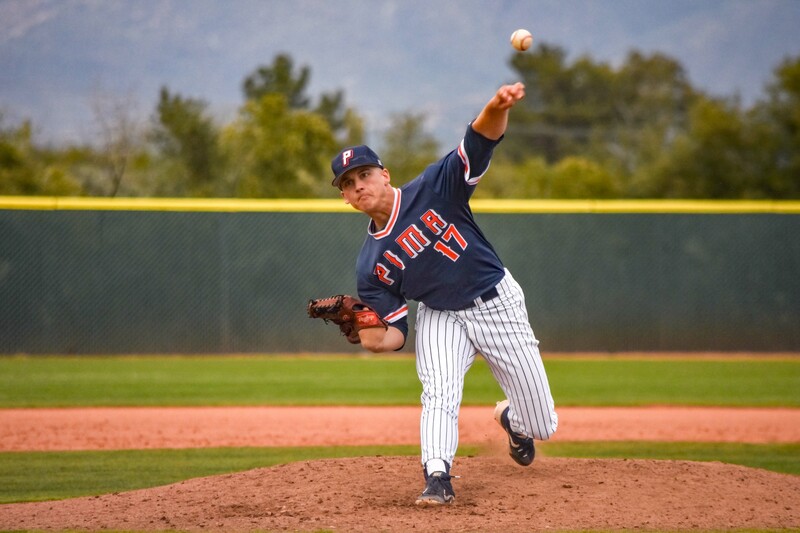 Karl Koerper and Sikies added solo homers in the sixth and seventh innings as Pima won 8-0. The Aztecs lost the second game in 7-6 in extra innings. The Aztecs visited Paradise Valley Community College in a double header. The Pumas would earn a shutout victory in the first game, winning 8-0 and delivering Austin Byrne his first loss of the season, thus bringing his record to 6-1 as he gave up 6 runs, 4 earned runs with four walks, in just over four innings. The Aztecs showed grit coming back out and winning a hard-fought extra inning victory 7-5. The game was close until Pima jumped out to a 5-2 lead in the bottom of the eighth inning, scoring 3 runs with 2 outs. Ochoa reached on a walk and scored on a wild pitch, and Koerper drove in two more on a single. With their back against the wall, the Pumas tacked on 3 in the bottom of the ninth to send the game into extra innings. Ochoa drew another walk and would score on a Rollon triple. Rollon then would score on a wild pitch to take a 2-run lead. Moraga would come in and get the last five outs, recording his fifth win of the season. Udall went 8 innings, giving up 5 runs, 3 earned in a hard-fought no decision. The Aztecs played host to Gateway Community College playing a doubleheader and sweeping the Geckos. Porchas and Padilla would have an impressive day as they went a combined 11-16 driving in 6 RBIs and scoring 8 runs over two games. Moraga started the first game and had trouble finding the strike zone, walking 6 players and giving up 4 runs over six innings. Javier Nava had a big game, driving in 4 runs, three of them came on a bases-clearing triple, and another came on a sacrifice fly. Porchas drove in one going 4-4 on the day, and Padilla went 2-4 driving in one more. Conner Nantkes earned his third win of the season in the second game giving 2 runs, 1 earned in just under eight innings and going 7 2/3 innings, racking up 8 strikeouts. Koerper and Porchas both hit home runs, driving in a combined 5 runs. The Aztecs swept the No. 6 team in the nation in convincing fashion over two days at the West Campus, including a two-game doubleheader on March 16. The Pioneers couldn’t get it together as they committed 10 errors over two games and 13 over the series. Pima won in a run rule shorted game 11-1 in the first game and 10-1 in the second game. Bryan started the first game going the distance tossing a five-inning complete game and giving up 1 run on 3 hits and improving his record to 6-0. Padilla won the ACCAC Division I Player of the Week. He went 3-3 with a walk in the first game to go alone with 4 RBIs including a game ending walk-off single in the first Cole Cummings, Sikes, Porchas, Koerper, Garrett Lake all tacked on RBI as well. The bats didn’t cool the second game as the Aztecs jumped out to a 3-0 lead in the first innings. Pima would tack on two in the third, four more in the forth and hit the double-digit mark in the sixth by adding one more run and bringing the score to 10-1. Hayden Udall earned his sixth win of the season bringing his record to 6-2. Udall pitched into seven innings racking up 8 strikeouts and giving up 1 run. Nantkers and Moraga closed out the game, pitching the last two innings. Padilla added 2 more RBIs in the second game, bringing his total to 6 on the day. Game 3 of the series wouldn’t be as easy, because the Aztecs would play catch up for most of the game, falling behind 5-1 in the eighth inning before Pima would begin to rally. The team scored 2 in the eight and 2 more in the ninth. The Aztecs would go on to win it in the 10th inning as Sikies led off the inning, and Richard Ware followed with a game-winning single. Emilio Lovato pitched the last two scoreless innings and picked up his first win of the season to bring the game to a climatic ending and start the Aztecs on their hot streak.